With software these days you can recreate almost any sound you want. The hulking equipment that used to produce electronic music is long gone. And yet, people have a desire to touch buttons and turn knobs. The Roland Boutique Series is a middle-ground between the digital age of music making and the classic synths of old. It’s a ton of fun—even if you don’t exactly know what you’re doing. 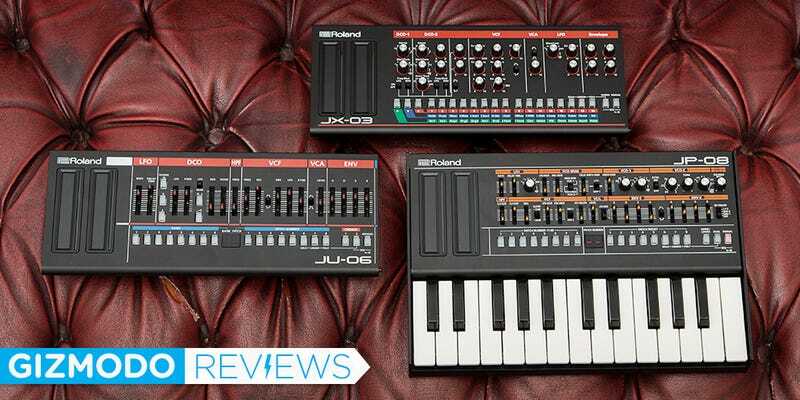 Miniature digital recreations of three classic Roland synthesizers. They can be played with any MIDI controller or paired with Roland’s own keyboard module that’s sold separately. The $400 JP-08 is based on the Jupiter-8 from 1981. The $300 JX-03 is based on the JX-3P from 1983. All the modules are compatible with Roland’s separate keyboard attachment, which is $100. The original versions of these synths can be found used for quite a bit of cash. The Jupiter 8 is around $10,000 these days! For enthusiasts craving these particular sounds, these little guys are a great cheap compromise. More broadly, a lot of instrument makers are trying to cash in on their heritage in electronic instruments. Korg did it with their Volca line of mini analog synths, to some success. Devices like these are super fun and present a relatively low barrier-for-entry if you’re wanting to experiment with electronic music but don’t want to learn new software. There’s something about these things that makes you want to fiddle around. They look completely badass, and they are built pretty well too. The casing is metal, and the dials and sliders have nice tension. For $300, I was surprised at how sturdy they feel. The keyboard attachment is nearly as nice feeling. You can adjust the synth module so it sits either flat or at two variable angles, looking all retro and cool. If you’re not familiar with how analog synthesizers work, the Boutique Series might intimidate you, but once you dive in, it’s hard to stop tweaking and playing. The layouts and options for each module is different, but they all involve combinations of oscillators, envelopes, LFOs, and various modulators. Each one also has two ribbon controllers, banks of presets, and a 16 step sequencer for your pleasure. After getting your bearing with all the sound controls, it’s nothing but joyful analog bliss. Well, not really, as these are not actually analog synths. They are digital synths modeled after the circuitry of the original versions, which were themselves sort of hybrids with digitally controlled oscillators and analog filters and envelopes. I’m not an expert in the nuances of synth sounds, but from what I’ve heard people say so far, these things do a pretty dang good job of emulating the character of the originals. The JP-08 is the most complex of the three, and that is reflected in the extra $100 on its price tag. It’s easy to get overwhelmed, so if you are unfamiliar with the parameters of a synth, maybe try the JU-06 or the JX-03 first. My biggest complaint about usability across the three devices is the sequencer. It works perfectly fine, but figuring out how to access its various settings with the very minimally labeled buttons is a chore. Remembering all of it is even harder. I have the Korg Volca synths, and found those extremely intuitive to learn with very little help from tutorials or manuals. The Boutique Series will take a bit more time to master. In terms of connectivity, the modules have 5-pin MIDI in and out ports, ⅛” audio in and out, as well as a micro USB port which will not only power the unit but transmit 24-bit/44.1kHz audio for recording onto a computer. For maximum portability, the Boutique Series will run on 4 AA batteries, and there is an on-board amp and speaker for casual jams with no wires. I desperately wish Roland made a custom case for these things. You don’t really want to throw them in a backpack with no protection. They do a terrific job of emulating the experience of shaping sound with an analog synth. Build quality is on point. They are fairly cheap, with a small footprint for your desk. And so much fun, even if you have no idea about how to control a synthesizer. Great connectivity options. Learning curve is high for really figuring the things out, especially the sequencer functions. The keyboard attachment is a bit expensive at an extra $100. If you are an enthusiast, you probably have this question answered already and will only invest in the Boutique Series if you are looking for these specific classic sounds. If you are looking to experiment musically and dive into the world of synths, the modules are a fun, but slightly advanced, place to start. Yes, you can do this kind of stuff with audio software and a simple MIDI keyboard, but devices like the Boutique Series satisfy an urge to touch and control your sound in a much more intimate way. For the musically inclined, it’s a toy that will keep you smiling for a long time.